But I would have you without carefulness. He that is unmarried careth for the things that belong to the Lord, how he may please the Lord:” (1Corinthians 7:32, KJV). Connections is the Singles Life Group at Mt. Olive Church of Plano. Our goal is to foster an environment where people come together to share experiences, encourage one another, learn truth, have fun and connect with like-minded single individuals. Throughout 2016 we will discuss various topics, including goal setting, finances and physical fitness. We are also planning other activities. 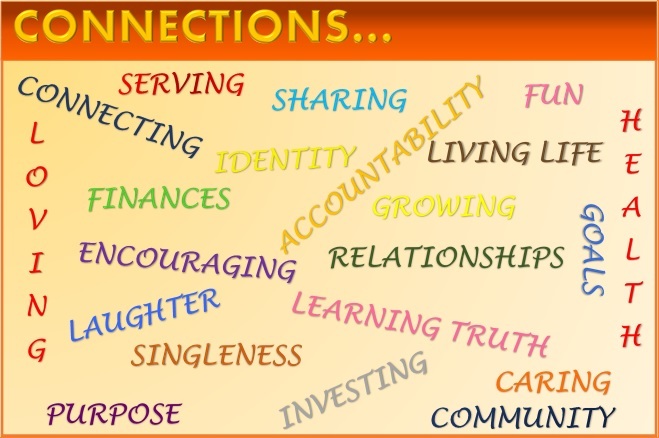 Connections will meet the 1st and 3rd weeks of each month at Mt. Olive Church of Plano unless otherwise specified on the website. Bookmark our webpage to stay informed.